Captain Billy Godleman knows his side were poor in the first 35 overs of the Worcestershire innings. Derbyshire captain Billy Godleman felt his side’s bowling let them down after they were beaten by Worcestershhire by 50 runs in the Royal London Cup. The home side, who are anchored at the foot of Division One of the Specsavers County Championship with no wins in five, got their first win of the season with the victory. He said: “We did ‘travel’ in the last 10 overs of their innings but it looks a lot worse because of the way we did bowl in the first 30-35 overs. “Some of the execution of our plans bowling-wise was not quite what we expected today although the slower bowlers did well, taking the pace off the ball in the middle of the innings. Worcestershire quickly settled back into the form which earned them a semi-final place in the One-day Cup last summer after an impressive performance with bat and ball. Worcestershire amassed their second highest score in 50 over cricket at New Road after an explosive half century from Ross Whiteley gave the innings late momentum. Wayne Madsen’s classy 87 gave the Falcons hope but they were eventually bowled out for 273 in the 47th over. Whiteley has spent the winter playing in the Bangladesh Premier League and the Pakistan Super League either side of the inaugural T10 tournament in Sharjah. That had followed on from him becoming the first Englishman to hit six sixes in an over – in a T20 Blast match against Yorkshire at Headingley. After sitting out the opening five Championship matches, Whiteley stepped up to the plate to smash 58 off 39 balls with three sixes and seven fours. 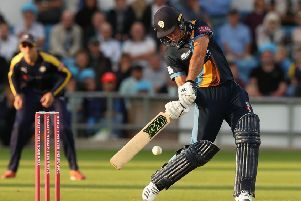 All three of his shots which cleared the ropes resulted in a lost ball as he and Ben Cox – 56 not out from 51 balls - plundered 101 off 10 overs for the sixth wicket. Tom Fell (56) had earlier helped lay the foundations for the late assault after the cheap dismissal of openers Daryl Mitchell and Joe Clarke. He shared in stands of 60 in 13 overs with Travis Head (30) and another 62 in 11 overs with Brett D’Oliveira (46). It was another sign of a return to form for Fell, who failed to score a half century in any cricket last summer, after his 88 against Surrey at the Kia Oval. Derbyshire suffered an early setback as Worcestershire skipper Joe Leach held onto a sharp low return catch to dismiss Ben Slater (10). Luis Reece was promoted up the order and added 51 with Billy Godleman before the Derbyshire skipper – a century-maker in Thursday’s win over Warwickshire - played forward to Head on 23 and was bowled. Reece found another willing ally in Wayne Madsen during a partnership of 77 in 13 overs. But after achieving a List A best 62, the former Lancashire player went for a violent heave at Ed Barnard over mid wicket and was bowled. Josh Tongue returned to the attack and a fine straight and rising delivery accounted for Matt Critchley (12) who attempted a hook and top-edged through to Cox. Madsen has been a thorn in the side of the Rapids on more than one occasion and he reached a 45 ball half century. But after making 87 he reverse swept Head into the hands of Tongue at gulley. Mitchell’s medium pacers sent back Daryn Smit (22) and Hardus Viljoen (0) in the space of three balls and D’Oliveira’s stunning returning catch put paid to Safyaan Sharif (1). Alex Hughes (47) struck some lusty late blows before falling to Leach.